The Entegra Release 9 from Avidyne is a total upgrade of the existing Entegra avionics suite to be found in your aircraft. During the upgrade your old PFD & MFD, as well as your old GPS/NAV/COMs, will be removed and replaced with a new and state of the art flight deck system. Along with all new high resolution glass you will receive dual ADAHRS for added redundancy, as well as dual FMS900w Flight Management Systems with a QWERTY keyboard. What is Entegra Release 9? The architecture of the Entegra Release 9 is full modular and is certainly the next generation when it comes to general aviation integrated flight deck systems. Your own Entegra Release 9 system will include high-res IFD5000 displays, dual Air Data and Attitude Heading Reference Systems (ADAHRS), dual-redundant FMS900w systems with a QWERTY keypad, next-generation fully-digital 16-watt VHF NAV/COM radios, and dual WAAS/RNP-capable GPS receivers. The new Page & Tab user interface is an innovative offering in navigation from Avidyne, meaning no more exploring hierarchical menus to try and find the information you need. The data that you want will be at the touch of your fingertips. Each individual IFD5000 can perform the functionality of the other with no unfamiliar or limited reversionary modes due to the fully-redundant architecture of the system. The Entegra Release 9 from Avidyne is a system truly designed to eliminate any unnecessary complexity, reduce head-down time, provide a new level of redundancy and, most importantly, to dramatically improve the safety of all onboard your aircraft. Avidyne’s clear goal is to put the most powerful aviation technologies into simple to use and highly intuitive interfaces. The result of this aim is the Entegra Release 9; a powerful, simple, intuitive and highly integrated flight deck system. The large-format and incredibly reliable LED-backlit displays incorporated within the Entegra Release 9 are the first ever to be totally interchangeable for use as PFD or MFD. As each individual Integrated Flight Display (IFD) is capable of performing any of the functions of the other there are no unfamiliar or limited reversionary modes required, allowing you to train as you fly and fly as you train. The fully-integrated and all-digital WAAS Gamma 3 COM/NAV/Surveillance (CNS) suite is managed efficiently with the intuitive FMS900w. At the same time a dual redundant databus interconnection automatically synchronizes the data between the different displays, the FMS Keypad and a full complement of safety sensors. Avidyne’s Entegra features a true dual-redundant peer-to-peer databus. This means that critical sensor and computation modules are never “daisy-chained” together in such a way as to cause cascading failures. Within this system single-point failures remain as single point failures instead of adversely affecting other highly important and otherwise operational functionality. Pilots must depend on their own good judgment, training and situational awareness in order to fly. The easy-to-learn and easy-to-use pilot interface to be enjoyed within the Entegra Release 9 will make your life as a pilot easier, with a user interface designed to reduce your workload and increase safety. The simple “page and tab” format found within the user interface of this system means no more complex functions and endless submenus to navigate through to find the critical information that you need. No more multi-day training courses, no more ridiculously think user guides and no more complex page structures that the previous generation of general aviation avionics required. Access to the powerful capabilities offered by the Entegra Release 9 is as simple as pushing the desired bi-directional page key. Any different display options to be found within a page are represented as tabs and pressing the same key in your desired direction will take you through the tabs. Congratulations, you now know how to use the Entegra Release 9. The all-new Entegra FMS900w is a Flight Management System (FMS) designed specifically for our second century of flight. It will consistently deliver highly-advanced and yet simple FMS capability for single-pilot IFR flight. Entegra Release 9 makes creating and editing your Flight Plans a doddle. All of the basic functions that you need are easily accessible via the bezel controls or through the optional ACD215 Control/Display Unit. Every FMS operation can be performed without ever taking your hand from the IFD knob. Every drop-down menu that you encounter is designed to be context sensitive, with choices displayed in an exceedingly useful prioritised order. The cursor itself is also context sensitive, providing a clear indication as to whether your current operation is designed to insert a leg to a journey or to modify a waypoint that already exists. This method of avoiding the use of any menus creates a completely intuitive method for performing all of the required basic editing functions. Save yourself the time it can often take to fumble through irrelevant NAVAIDs as in other systems with the innovative GeoFill found within the Entegra Release 9. GeoFill will predict your next leg or waypoint intelligently based on its proximity to your location, or to a previous waypoint within your flight plan, instead of basing it on a database order. As you enter a new destination the system will auto-fill the remaining characters in your entry, dramatically reducing the number of actions that you, the pilot, must complete. This auto-fill is based upon the distance from the current position, removing the requirement to filter through choices obviously too far away in order to get to the desired entry. You are likely to find that the system will actually display your required waypoint based on your initial suggestion. The FMS900w features an easy-to-use drop down menu system that makes airway flight planning easy. Once you have entered your ‘TO’ waypoint, the VIA edit field will open, displaying all airways and procedures (Victor, Jet, and Q routes) that contain the entered fix. Rotating either of the knobs presented will move the cursor through the list and a simple push of the rotary knob will select the appropriate airway and prompt for the termination fix. If the termination fix is already the next waypoint in the route, the FMS will automatically link the airway to that waypoint and close all currently open and now irrelevant menus. The Airway Flight Planning system, combined with Avidyne’s GeoFill functionality mean that you will need to use approximately 75% fewer keystrokes in order to enter a flight plan compared to existing systems. The all new FMS Vectors feature to be found within the FMS900w is an innovative solution from Avidyne designed to provide an easier way to fly. Using the FMS Vectors technology, the FMS900W can calculate the transition from the en route GPS phase of flight to the ILS intercept, before drawing a curved intercept flight path onto the display and even providing wind-corrected roll steering commands to the autopilot. Previous generation navigators forced the pilot to artificially suspend navigation between the en route GPS-guided course and the terminal phase of flight to a VHF navaid such as an ILS. In the transition between the en route and terminal phases of flight, these systems are simply “coasting” in a heading mode, which is not corrected for wind and ground track. One of the key features of Avidyne’s Flying Made Simple™ philosophy is that the pilot is provided with FMS guidance for the entire route of flight, from 200 AGL to 200 AGL, without any need to suspend or interrupt guidance to the Autopilot. This not only enhances safety, but also eliminates any confusion when it comes to different “modes”. All the pilot needs to do is “fly the magenta line” at all stages of the journey. Any changes that are made to the flight plan will be instantly applied, assuming they don’t affect the active leg, in order to reduce the heads down time of pilots. Changes made to the active leg are confirmed during a simple two-step activation process; whereas all other edits are applied to the flight plan as they are entered. The editing of an active route using the Avidyne FMS900w is particularly simple with the exceedingly intuitive insert cursor, making it easy for you to know at a glance where a new waypoint will be added. Planned alternative routes can be inserted into the flight plan by the pilot, as can instrument approaches to the alternate as part of the primary flight plan. The FMS will also intelligently analyse your flight route, graphically warning you of any discontinuities between your specified route and the airway structure. Multiple instances of the FMS will run concurrently due to the dual-system capability installed, resulting in fully-synchronous and redundant FMS processes. The FMS900w is optimised to take advantage of the dual concentric rotary knobs and line select keys on the IFD bezels; however an addition of one or more ACD215 Control/Display Units will easily facilitate any alphanumeric data entry requirements and meet the aircraft operational demands. The ACD215 contains the basic control keys for radios and FMS, including Direct-To, PROC, Vectors, and NRST functions, as well as the map range and pointer control. The navigational and communications prowess of the Entegra Release 9 stems from its CNS modues. The DVX740 is the first certified 100% digital software aviation radio, and the only one to feature a datalink-upgradeable radio capable of supporting NEXCOM next generation datalink protocols including VDL Mode 2, 3, 4. The Entegra Release 9 FMS has access to some serious navigational power thanks to an all-digital software controlled design. This means that the 4 COM/Datalink channels and the 4 NAV (VOR, LOC/GS) channels in each radio can operate at exactly the same time. Pilots are always on the lookout for the latest tools and information to enhance the performance of an aircraft, and to improve the safety of a flight. If you yourself are a technology-savvy consumer you will certainly find yourself looking for products that offer a growth path to the latest and greatest advanced features and functionality as and when they become available, providing you with the highest possible level of capability for the greatest value. 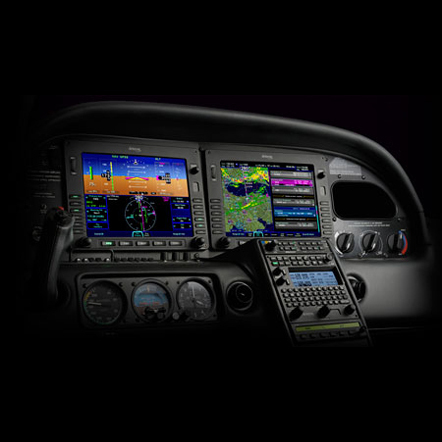 Since 2003 and the first Avidyne Entegra all-glass flight deck for general aviation, Avidyne has continually released the most up-to-date avionics systems available. 2004 saw the release of CMax™ Electronic Charts and certified XM datalink weather. The 2006 Entegra Release 6 added Flight Director, V-Speed & Heading on ADI, as well as additional datalink weather products on the MFD and support for the USB memory-stick dataloader. Release 7 in 2007 added support for WAAS/LPV approach guidance, amongst many other additions. With expansions of the Canadian and Caribbean weather systems in Release 8 in 2008, along with the additions of colour lightning with the TWX670 and support for a world-wide datalink with the MLX770 Avidyne continued to show their prowess in the field of avionics. From the earliest Entegra systems the ability has been in place to upgrade to current production software and hardware levels. So now, the Entegra Release 9 will bring your integrated flight deck to the highest level yet! Along with the functionality included within the Release 9, this upgrade will also provide you with the hardware platform required to support future software releases to support new display formats including Synthetic Vision (SVS), Enhanced Vision (EVS), and Highway in the Sky (HITS). The company Avidyne has continued to be found at the forefront in developing advanced display formats, dating back to their development of HITS and work with Synthetic Vision in 2001 on the NASA Advanced General Aviation Transports Experiments (AGATE) program.